Many may miss the entrance to Hong Leong Building‘s basement, which holds numerous eateries unbeknownst to the bustle of white-collar workers shuffling above ground. Little do they know, a bright, neon sign beckons hungry bellies, signal that a hearty meal awaits them at Tokidon. 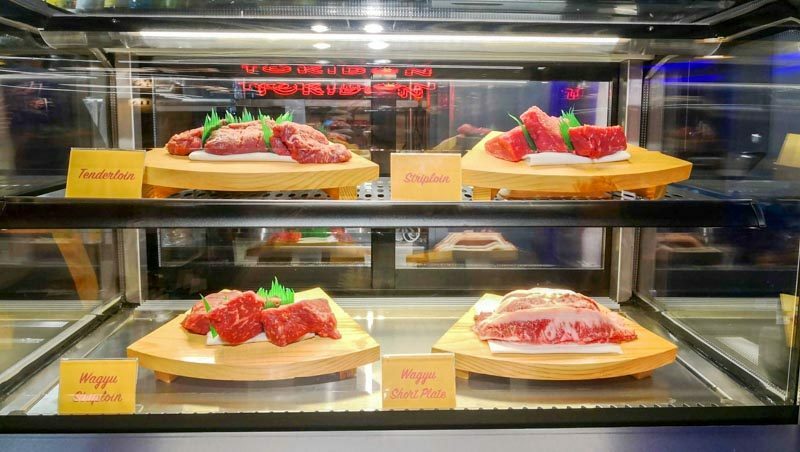 The first thing that’ll pull you in (besides the unmissable lights of Tokidon’s interior), is the well-lit display case that showcases the various cuts of meat that they use in their speciality beef bowls. Brought to you by the same guys behind Kabuke, their grade eight and nine sukiyaki is from the US, and their grade five and six wagyu is imported from Australia. Every piece of meat is cooked to medium rare, and you’re strongly advised against reheating your takeaway portions in the microwave, unless you wish to overcook the precious cuts of beef. 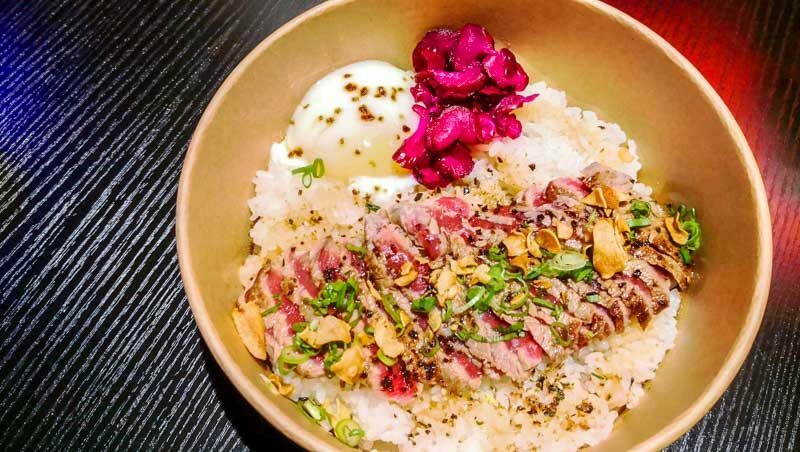 One of their highlights is their Truffle Wagyu Don (S$23.90). The slightly handsome price tag might be a turn-off, but be reminded that they use a generous amount of thick striploin slices that are drenched in their house-made truffle soya sauce. The garlic chips really made the entire bowl come together, and as a result, it truly was an intoxicating bowl that could distract us from the small hole in our wallet. Also, popping the onsen egg and giving it a good swirl around the bowl gave the dish a luxuriously creamy texture that we highly recommend you do as well! 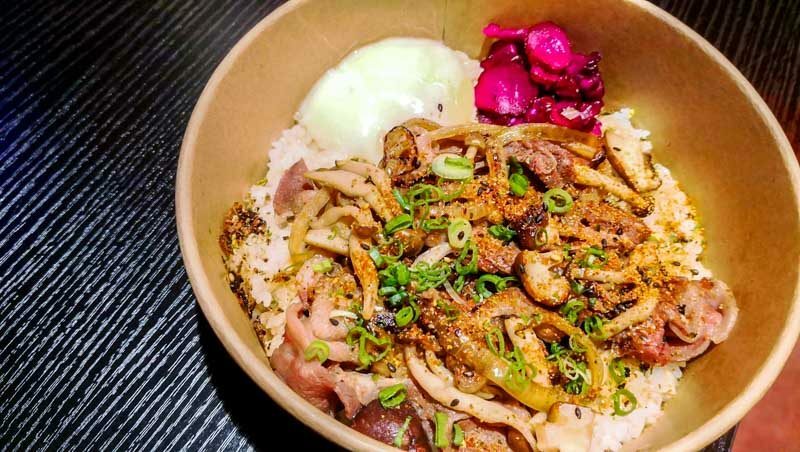 The Wagyu Sukiyaki Don (S$17.90) allowed us to truly enjoy the exceptional tenderness of wagyu beef, that’s mild to sweet in flavour on its own. Coupled with copious amounts of shimeji mushrooms and sauteed onions, the entire bowl was a sweet-savoury mix of protein and vegetables which required little chew. Compared to the previous bowl, this one would be better suited to those who prefer a less rich flavour profile, as we understand that the scent of truffle can at times be overwhelming on the nose for some. Feeling like having fish instead? 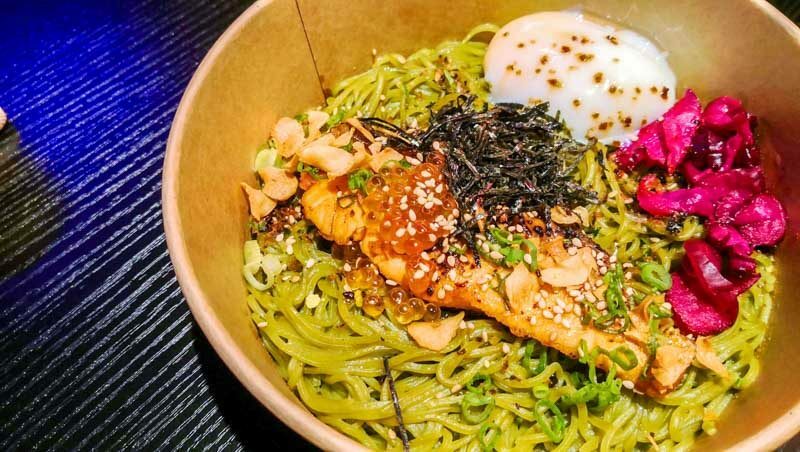 Give their Salmon Cha Soba (S$16.90) a shot. The salmon is sashimi-grade, so you can trust its freshness! Not usually one to go for a soba base, the noodles here had a great chew and the best part is that it’s served warm. It doesn’t come with a dipping sauce, but with the addition of the onsen egg and ikura, the noodles were just as enjoyable and tasty. As for the teriyaki-glazed salmon, it was cooked till lightly crisp on the exterior, while still remaining flaky and moist on the inside. Just the way we love our salmon cooked. 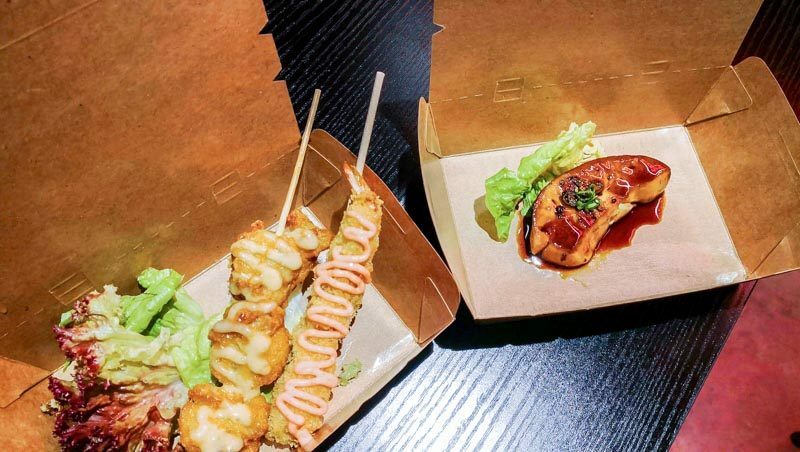 Besides beef bowls, they also serve a lean menu of sides, such as Ebi Fried Skewer (S$1.90), Tori Karaage Fried Skewer (S$1.90) and even a top-up option of Foie Gras (S$11.90) to throw into your bowl. The fried skewers didn’t floor us sadly, even when a drizzling of yuzu mayonnaise tempted us to give it a thumbs up. However, if you’re in the mood to pamper yourself, the foie gras top-up option sure is a great way to level up your meal! The foie gras wasn’t too gamey, and the sear on it was impeccable. Its core was akin to savoury custard, and we didn’t want to rush through finishing it off too soon, choosing instead to savour every mouthful. 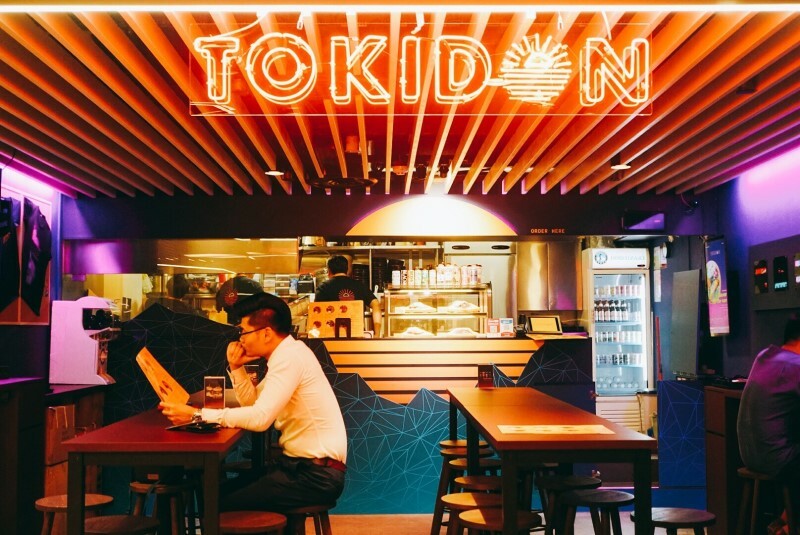 The CBD has one too many offerings for the busy bee, but Tokidon is here to tell you that you don’t need to scrimp on a quality meal just because you’re rushing for deadlines. Premium cuts and the guarantee that you’ll be super satisfied? Now, that you can’t put a price on.